Barry and I had talked about going back to Tellus Science Museum for quite a while, recounting our individual visits, and finally went up a few months ago. Turns out, we'd visited very different places. It was a number of years ago that Barry had visited what was later absorbed by Tellus...an impressive gem and mineral collection, which was housed near today's Tellus. Before changing his major in college, Barry studied geology, so Tellus was a welcome excursion. I've mentioned previously that before I wanted to be an astronaut I'd wanted to be an archaeologist. Louis Leakey—who was a mentor to Jane Goodall and Dian Fossey—was my early childhood hero. So, you can imagine, a geologist and an archaeologist set loose in a gem gallery and a dinosaur gallery...we had as much fun as we did when we were kids! 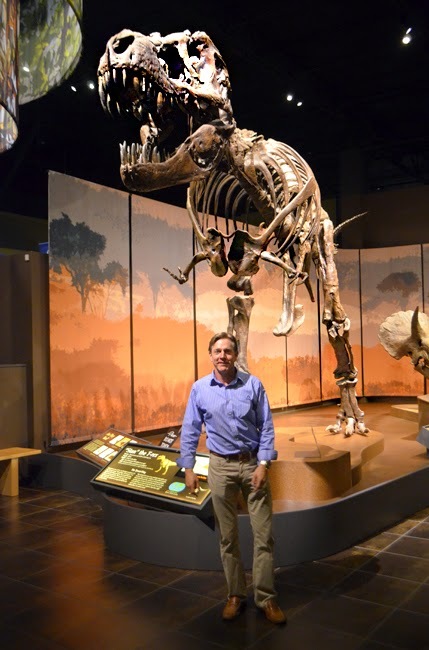 Actually, I don't remember seeing a dinosaur exhibit when I was a kid, but I remember visiting my 5th Grade teacher, Mrs. Cobb, after I graduated high school and remember how tiny the desks and chairs were...and as adults we think dinosaurs are big! 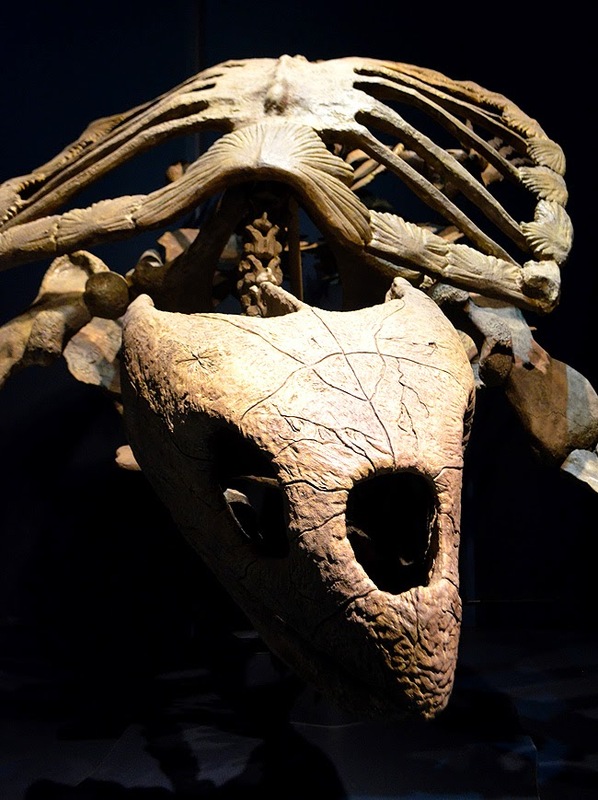 The dinosaur skeletons at Tellus are replicas, BUT each of the larger exhibits have within it a real fossil, and there are many other fossils throughout the gallery. I mentioned that Tellus was very different memories for Barry and for me. I'd been for the first time a few years ago and Barry long before that. So, when we were pulling up to Tellus, a familiar sight for me, the giant Komatsu truck was new for Barry. I just love that truck! 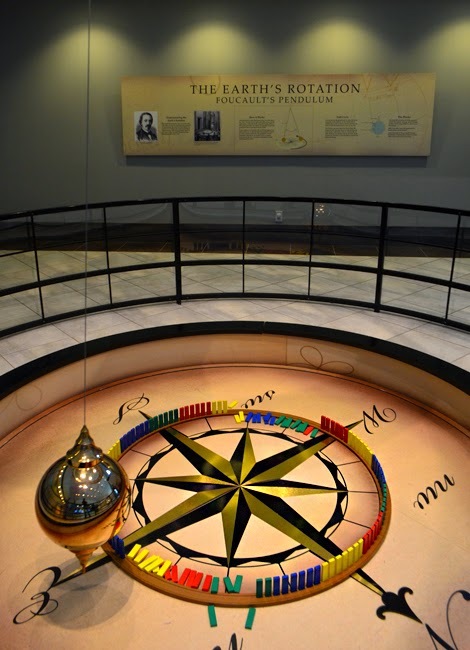 One of my favorite exhibits at Tellus is the Foucault's Pendulum, which is near the entrance, if I recall correctly. It's captivating. One could easily get lost in understanding the premise of the Pendulum. To give you an idea, the original was built to demonstrate the Earth's rotation of approximately 1,000 miles per hour. The sphere is moving back and forth, but always in the same plane...the floor is moving, with the Earth—it's fixed...hemisphere and latitude come into play, as do friction and gravity. It's truly fascinating...you must observe (and read about) it! 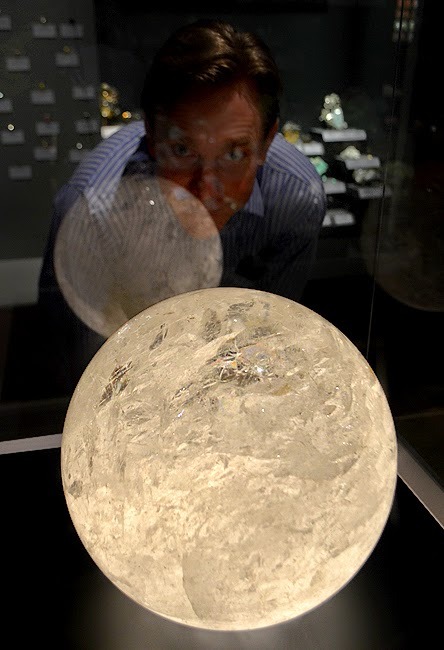 And just for the record, the reflection in the sphere is about as close to a "selfie" as I typically get. Fortunate for my readers I'm not as photogenic as some of my friends. Back to when we first arrived, it was a first experience for Barry. Turns out that we'd not been talking about the same place...the same gem and mineral collection, yes, but not the same structure. It was a pleasant surprise for Barry, especially that what he'd seen before had grown to become the Weinman Mineral Gallery. I have a small collection of crystal spheres myself (some glass ones, too), just because I like them. I especially like the larger ones at Tellus, one being quartz (at which Barry is gazing above) and solid black one of Obsidian, from Brazil, which is mesmerizing. 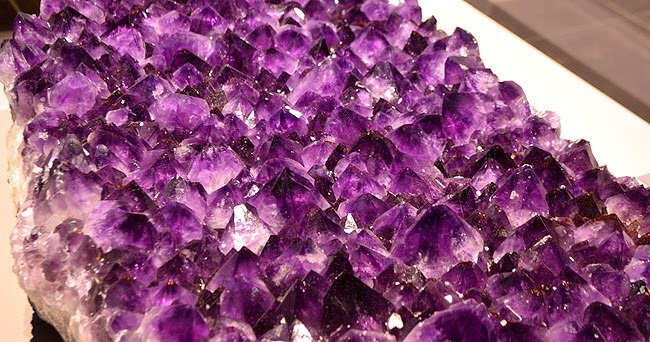 My sister would love all the amethyst at Tellus. They have quite the collection, including a display of Georgia amethyst. The piece pictured above is (not from Georgia), I venture to guess, several feet wide...an impressive specimen! There are hundreds and hundreds of other gem and mineral specimen that are much more colorful than what I've shared in this post, as well as some fascinating phosphorescent (glow-in-the-dark) specimen. I've told so many people about Tellus' Periodic Table of Elements display that I can't remember who I've told and who I haven't. Anyway, it's absolutely brilliant! And a super fun way to teach youngsters about chemistry. 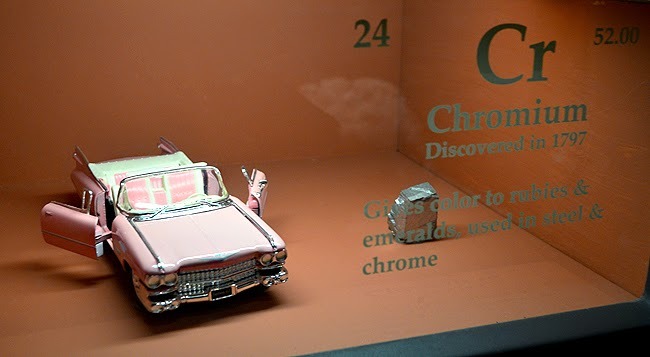 What I like about Tellus' exhibition so much is their humorous approach to connecting elements to household names, including a toppled dinosaur (Iridium), Einstein (Einsteinium), and a pink Cadillac (Chromium). 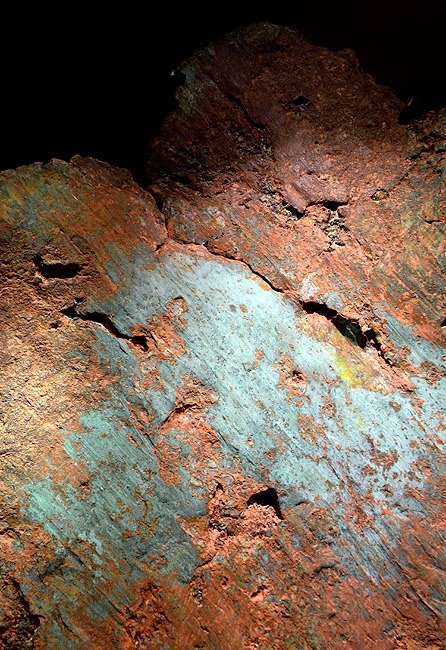 The "piece" of copper pictured above is actually a copper boulder! 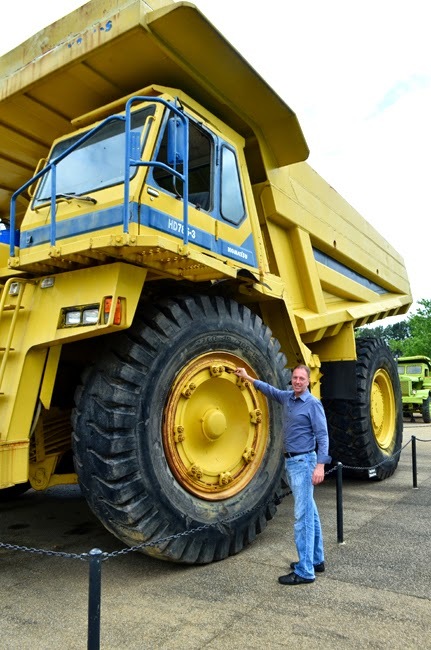 It's 9 feet by 7 feet and weighs 4,950 pounds! There is fascinating exhibit after fascinating exhibit at Tellus...I could go again and again, and to my delight I have. There's so much going on at Tellus, it's practically impossible to do it justice in a single writing. In addition to the mineral, fossil, transportation, and family galleries, there's a planetarium, an observatory, a panning for semi-precious stones and digging for dinosaur bones experiences, and LOTS of events and special exhibits! There's a model train exhibit being featured right now, stretching over 100 feet of track, that I want to go back and see! What kid, grown or otherwise, wouldn't want to see a massive collection of model trains? Even theoretical physicists like model trains! The Fossil Gallery is fascinating! From the jawbone of a shark the size of a school bus to a fossilized pine cone, and a T-Rex, this gallery is fantastic. And it has specimen of animals that I'd never heard of before...I used to think I was a fairly knowledgeable dinosaur enthusiast! But you gotta love learning and that's what Tellus is largely about. The Science in Motion gallery at Tellus is quite impressive. 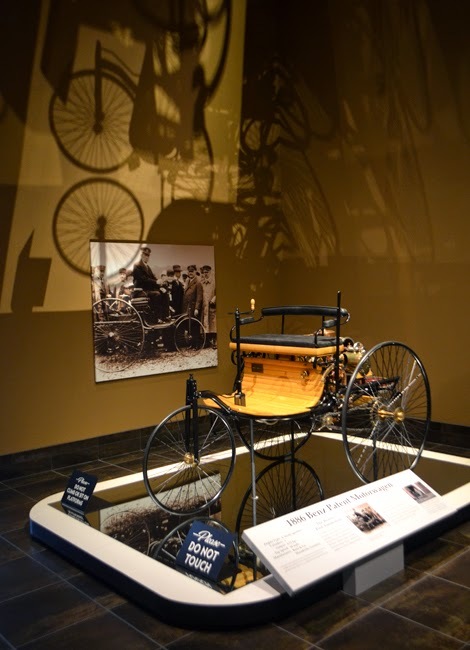 It features transportation from the earliest motorized bikes to one of the first electric cars—1903, believe it or not!—from Kitty Hawk to humans' journey to the stars. One of the things that I love about this gallery, a feature that I'd quite honestly forgotten about so was pleasantly surprised by again, are the mirrors under the various vehicles on display. You get to see the underbelly of the awesome vehicles, making them even more awesome! There's also a collection of launch vehicles—rockets—some of which I've seen in person, including a Proton. At a former job, I had the great fortune to travel to the Baikonur Cosmodrome, where the first human was launched into space (Yuri Gagarin), to see a satellite liftoff on its way to geosynchronous orbit. What an amazing experience! Tellus does a remarkable job of chronicling humankind's journey into space, given the limited space allotted for that era of our history. 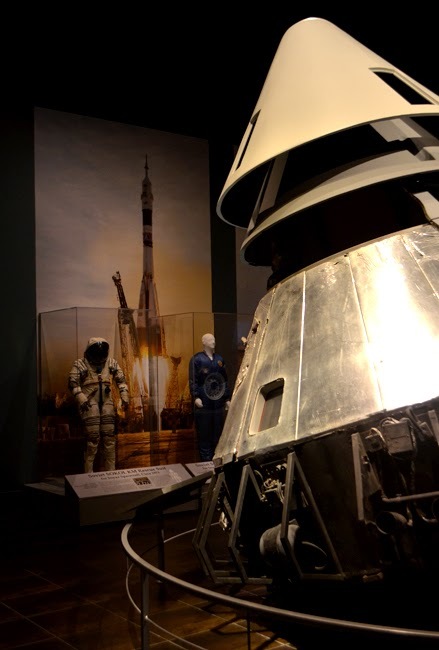 Among the artifacts is a replica of Apollo 1, the capsule in which Edward White, Virgil "Gus" Grissom, and Roger Chaffee lost their lives in a fire during a routine pre-flight exercise. As a space enthusiast, I'm grateful that Tellus has remembered these brave men. I've also had the great fortune to be mere feet away from the Space Shuttle Endeavour, to see the Space Shuttle Atlantis on its launch pad, to visit the White Room where various components of the International Space Station have been built and to visit Cape Canaveral for a live launch. I'm a lucky guy to have experienced so much, and places like Tellus bring those memories flooding back! And I must give a shout out to JD's Bar-b-que in Acworth. We left Tellus just as rush hour was at its peak. Barry remembered a really good BBQ place in Acworth, so we exited the interstate for a quick bite before meeting our friends later. We couldn't find that place, but found JD's on my phone and tried it out. Fantastic! I totally recommend going. Check out my first visit to Tellus here and then get yourself and the kiddos up there! You're going to have great fun—I can practically guarantee it. I've been several times now and have had a wonderful time every visit, especially this last visit. Head over to the wanderlust ATLANTA Facebook page where you can find more photos of our Tellus visit!